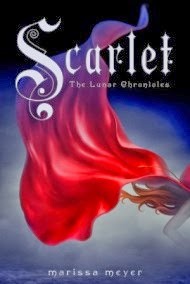 Scarlet is the second book in the Lunar Chronicles by Marissa Meyer, which began with Cinder, a book I was very taken with. Cinder is a futuristic cyberpunk take on Cinderella. Scarlet kind of does the same thing with Red Riding Hood. I say "kind of" because this is still Cinder's story, and for a long time Scarlet had her own story that was barely connected with Cinder's. Readers swing between the two storylines. Scarlet's is a very traditional woman attracted to a bad guy stranger and getting him to help her with a quest tale. Cinder's story is the traditional royalty in disguise, birthright stolen from her thing. But I'm already committed to Cinder because of Cinder, so I liked her part of the book better. Oh, look! The next book in this series, Cress, has already been published. And, gasp, there are short story prequels for this series. So much to read.